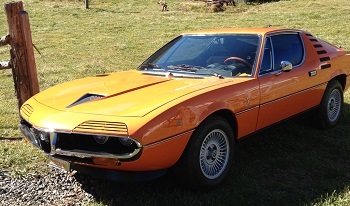 The original Spica Injected Alfas have become desirable collector cars. New owners and investors are intrigued with the mechanicalness of these vehicles and want them original as presented by the factory. With our H&W high performance systems, the engine can remain very correct looking and be upgraded internally for great gas mileage and low emissions. These Alfas were designed for the American market and other than the exotic Montreal 8C, there are very few 4C Alfas in other parts of the world with mechanical injection. We offer full service rebuilds, and a do-it-yourself tune-up kit including our SPICA manual. Hemmings Motor News, an excellent magazine in print and online for car collectors, published a SPICA article. "The best ever written in the aftermarket" says Wes. Road & Track recently took up that challenge and published this feature. 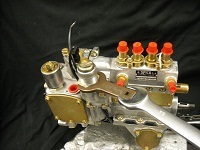 We also offer restored high performance throttle bodies and injectors, and replated injection pipes and hardware. Also check out our restored intake manifolds. All parts and castings are cleaned in our large ultrasonic parts washer. Get your pump order in the queue. 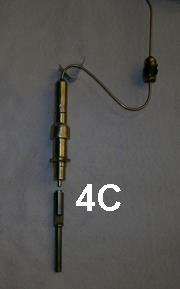 The Thermostatic Actuator (TA) functions much like a Choke. It has a life span of 8 to 10 years. If your engine runs very rich, it is very likely the TA needs replacing. 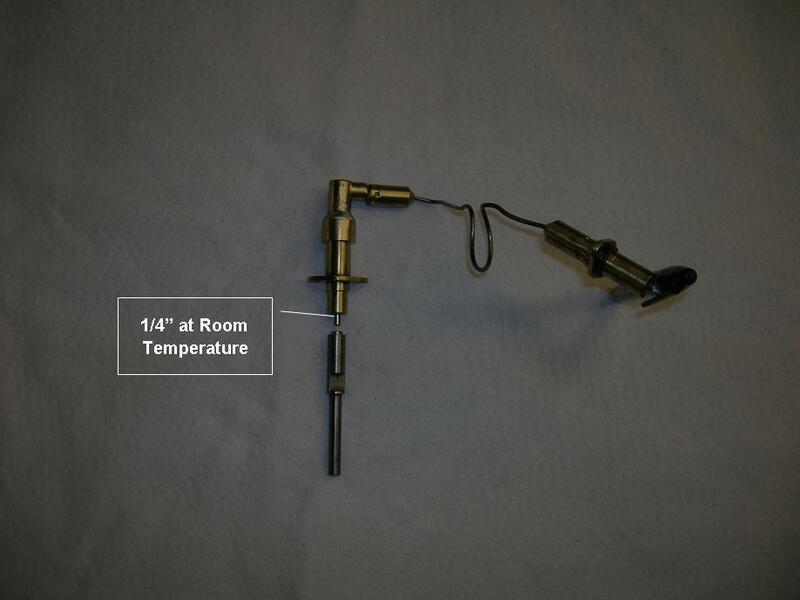 The picture of the TA on the right is correct at room temperature. The steel pin must extend past the brass at least 5 mm. If the pin is only extended 4 mm or it is flush, send the TA to us for rebuilding. It is not necessary to test it in hot water. Remove the two 4mm hex nuts first from the mid-clamp device half way up the tube. These fasteners are usually rusted requiring rust-buster and a good grip on the nuts to remove them. Do not send the small bracket that attaches to the intake manifold on the 4C cars. Please take care not to bend the tube excessively. Included with our TAs are two 4mm Allen socket screws to replace the slotted 4mm screws. You can use a long "T-Handle" Allen tool to simplify the re-installation of the TA. You may have to remove the screws up to three times to get the .5mm (.019 in.) hot reference gap correct. Note the adjusting screw on the shaft that allows for setting the .019 in. reference gap. The shaft and compensating screw is inside the pump, not visable from the outside. Use this screw inside the pump to make this adjustment. Do not use a Dummy TA. Once the TA has been replaced and set up correctly you can expect your Spica system to run good and to be very reliable We will do our best to have TAs in stock for a quick turn around as long as we know your old TA has been shipped to us. 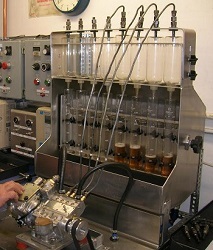 After reconditioning all injectors are run at very high speeds and fuel volumes on our custom test bench. Injector pulses must also be clean and crisp at very low speeds. 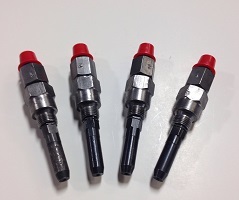 Click here for information about injectors. We replace all the plungers and barrels on all our rebuilt pumps to prevent gasoline from seeping into the engine oil. Our pumps include upgrades to correct several original pump design defects. After re-assembly each pump is installed on our test bench and run for more than 8 hours that simulates actual engine operating conditions. Fuel calibration is set to less than 1% differential between cylinders at selected speeds and load points. This results in more power, fuel mileage and reduced emissions. Most old pumps leak gas into the engine oil. 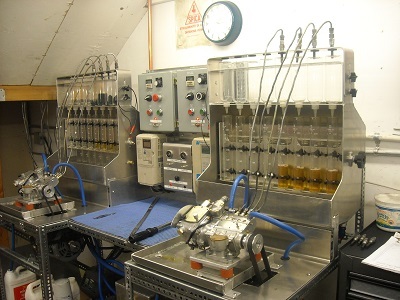 How to Test for Gas in Oil in 4C Spica Pumps (560KB PDF). Our Brass Hex Nut and Alloy Wrench replace the difficult to adjust factory fuel solenoid. 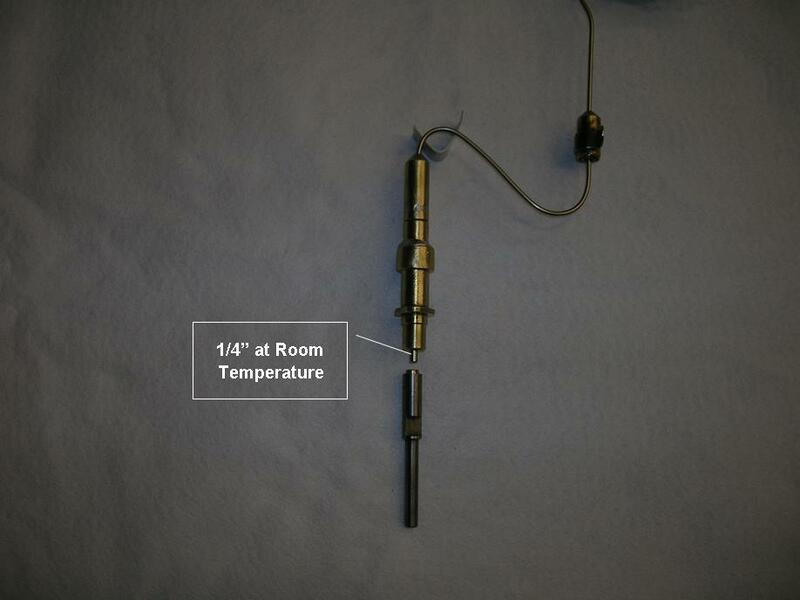 Due to tough emission laws, the injection systems were designed to be tamper proof. Anytime the injection pump is serviced or replaced it is necessary to re-set the air/fuel mixture. The original fuel solenoid lock nut was designed to require a large, deep-socket spanner tool. We produced a limited supply of special aftermarket spanner sockets until costs became prohibitive. We designed a new Hex Nut to allow use of a short wide-mouth wrench that allows using a 19 mm end wrench on the end to firmly seat the large brass hex nut. You can now make air/fuel adjustments without removing the air box/air cleaner. The nut and wrench are precision CNC Billet machined tools designed to last the life of the vehicle. The new brass nut and hardened alloy wrench are now included on all our rebuilt pumps that have the threaded fuel solenoid. You can now upgrade your existing Spica pump by purchasing our Do-It-Yourself tune up kit: Our Spica Book, Nut and Wrench is listed on our price list. For factory stock engines with original cams the best pump is the pump model type originally installed on the vehicle. The original “69” 4C single solenoid pumps are every bit as good as the later 2L pumps. The backfiring defect on the 69 pumps is corrected during rebuilding. Our HP (high performance) Spica Pumps feature a 4th dimension fuel curve in the pump “Logic” section that improves the air/fuel ratio at high rpm. Confused about cam timing? Please contact us before you decide. There are no new magic cam profiles, but the mysteries of performance cams remains legendary in the minds of many car owners. Send all the details of your engine upgrades. We will assist you with the selection of cams that are correct for your engine and your driving style. 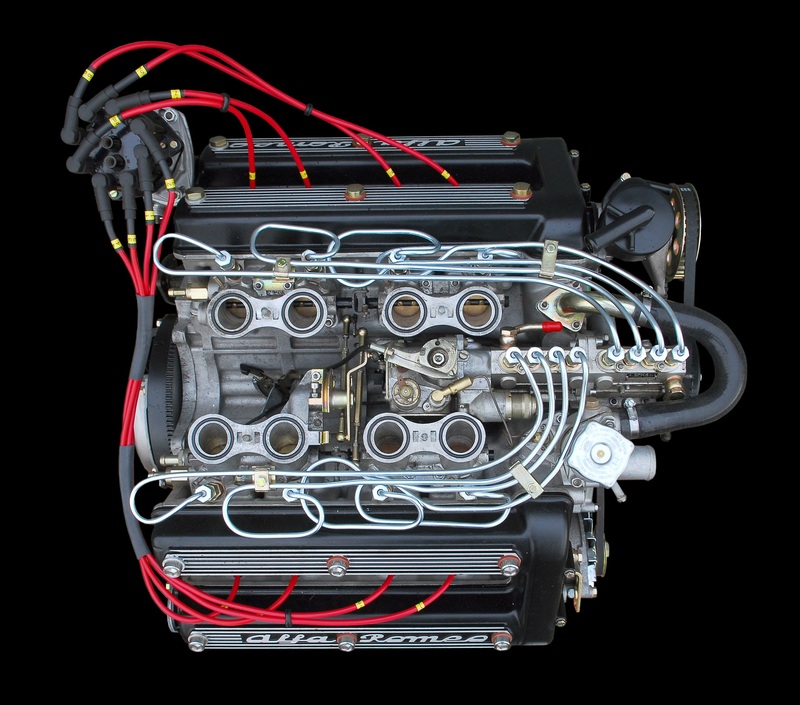 Whether carbureted or Spica Injected, the factory designed “individual throttle per cylinder” intake system is a feature usually found on rare and exotic vehicles. As compared to a single throttle plate in take system, throttle per cylinder intakes are much more forgiving, allowing engine upgrades and more robust cam timing. Idle quality can be very good especially on highly modified HP Spica systems. You can plan on a 25% to 35% power increase with your street Alfa running 92 octane pump gas. Send all the details of your engine upgrades. Our rebuilt pumps feature the fruits of knowledge gained over our years of rebuilding them. We have identified their weaknesses and have developed alternatives and guidelines to make them last longer. Each of our pumps have these upgrades installed. 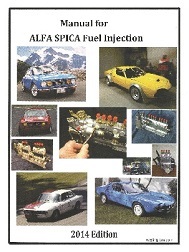 Our "Manual for Alfa Romeo SPICA Fuel Injection" by Wes Ingram is written as a do-it-yourself guide for owners. The first edition was written in 1985 and as we gained knowledge, 10 new editions have followed. For 2017, we have added a Kindle edition! Now you can read our manual on your Kindle Fire, any tablet or computer with the Kindle Reader App. In the USA, click here to buy it on Amazon. Elsewhere, search your amazon for "Alfa Spica Book" (available worldwide in US English). It took 4 years to design our dual test benches. We installed and put them into operation in the summer of 2013. The complex design of the mechanical gasoline injection pumps requires from 20 to 80 hours of bench time after they have been assembled. The benefit of having two benches allows us to run two pumps at the same time which has cut our turn-around time in half. 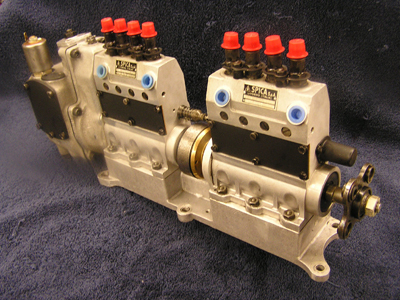 All phases and components of the pumps are run and tested to match the engines various speeds and power. When sending your pump to us for rebuilding we need to know the intended engine upgrades even if it is a mild camshaft upgrade. Maintaining the pump calibration to within 1% accuracy between cylinders results in low emissions, improved gas mileage and more power and torque. 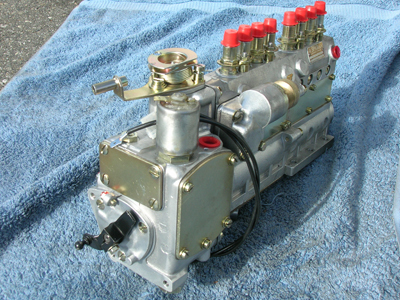 HP pumps are a very popular option that exists for owners of modified Alfa motors. The HP pump matches the fuel metering characteristics to the breathing mods done to the engine. You wouldn't throw larger cams in the motor without increasing jet size, would you? Without modifying the pump's fuel distribution curve you won't maximize the potential of your improvements. The heart of the HP pump is the re-profiled 3-D cam. We've developed several styles of the 3-D cam to deliver correct fuel mixtures at all engine speeds. It is necessary to specify the engine mods and power expectations on custom orders. 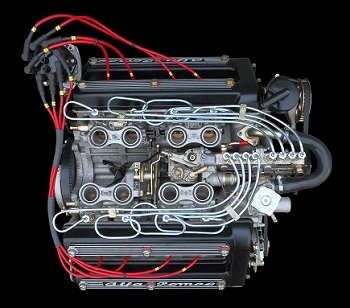 Note that the 40mm throttle bodies are available for all SPICA cars and particularly those with modified engines. Photo: Sven Heimbach. 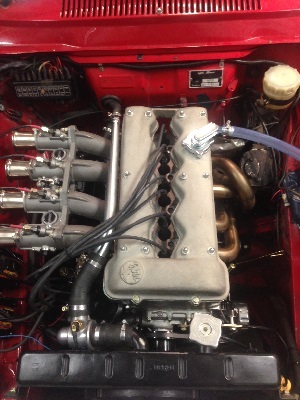 This GTAM engine has one of our 2013 series race pumps with flexible fuel lines. Click here for more Montreal 8C pictures & parts. Note the fuel pipes which are all the same length, requiring coils on the front cylinders. The pipes are actually 3 layers of tubing with an internal dimension of only 1.5 mm. There are no known replacements for the pipes. The pipe clamps and brackets are necessary to protect the pipes from vibration. The front four high pressure pump outlets feed the left side of the engine; the last four feed the right side. The 8 throttle plates must be synchronized and completely closed with the engine fully warmed up. 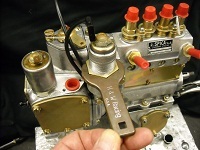 Idle air is provided from the idle/air mixer with small vacuum hoses that connect to the throttle bodies downstream of the throttle plates. Setting the fuel adjusting solenoid (FAS) must be done at 2800 rpm, never at idle. See our “Billet Nut and Wrench” that allows setting the FAS with the air box installed. 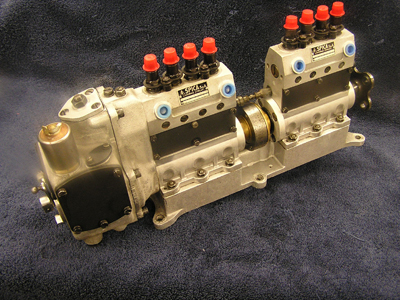 Injection pump timing is confusing to most owners since there are two “top dead center” events in all 4 cycle engines. The pump and distributors rotate at half speed. Ask about our new “Red Dot Pulley” for simplified pump timing. We have found many Montreals with the injection pump timing off by 180 degrees which results in a reduction of power and torque, fuel mileage and increased emissions. Some pumps require one to two weeks to setup and calibrate, even longer with the very stubborn ones. Because 8C pump spares and the unique parts are very rare, we have to remove the plated parts and ship them for re-plating, unlike the 4C pumps where we have hundreds of spares. Quality plating is a moving target in that we are always searching for better service. It's expensive and they do not like doing small volume plating especially for automotive. The first step is to call or to discuss the work to be done: that gets you in the queue. We can exchange most of the 4C pumps to the correct model pump for your 4C Alfa if your pump is not correct. We usually have a backlog of pump orders, so it is best to get your order started and in the queue before you ship the old pump to us for an exchange. Once your order is in the queue no one gets in front of your order, and we will prepare your new pump as soon as we can. You can ship the old pump two weeks before completion of your rebuilt pump: we'll let you know when that will be. Shipping Instructions: click here. Be sure to include your contact info (name, address, phone, email) in the box with your pump. We do not have Injection pumps on the shelf. There are 14 different Spica Injection pumps depending on the model and year of the car and the state of build of the engine. We do have a large supply of pump cores. We usually have the correct pump core in stock for your Alfa, with the exception of the 8C Montreal and a few very rare pumps. We do the exchange to ensure that you get the right pump. There can be a problem if the pump had been previously replaced with an incorrect model pump. The “T” number on the name plate is specific to the year of the car beginning with the 69 pumps (T-237/1) through the 80-81 pumps (T-265). The serial numbers are numerically sequential and not matched to the vehicle or engine. We can usually supply the correct model pump for a small fee even if the pump you send is incorrect. Ingram Enterprises is delighted to host these fine documents.